Of course he was was cool; he had a kombi, long blonde hair, and wore beaded necklaces and leather bangles. He was also about to try and ride a fearsome local wave that nobody had attempted before. 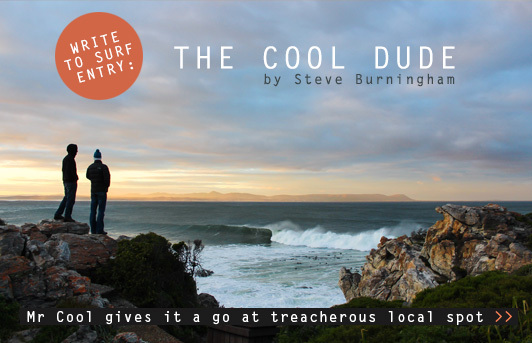 ‘The Cool Dude’ is Steve Burningham’s entry into Write To Surf – Zag’s surf journo competition with epic prizes by Billabong up for grabs (see details below). In the late 70’s and early 80’s we were grommets who got to spend many holidays in Hermanus. It was like a ghost town in winter. There were only one or two shops open where you could buy your necessities. Most restaurants and shops closed up for the winter. In summer it came alive for three weeks over Christmas. Very few people lived there permanently. 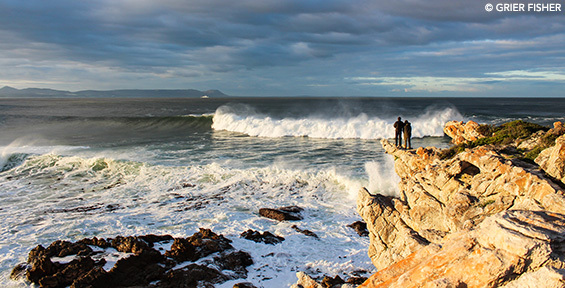 Hermanus was not known for its surf and most serious surfers gave the town a wide berth on their way up the coast. Some would stop off only to visit a girlfriend holidaying with her folks – hoping to get lucky, score a free place to stay, eat her mom’s food and drink some of the old man’s booze. Voelklip was our local surf spot. A not very good beach break which always seemed to be big, messy and closing out. However we played the cards we were dealt and surfed the re-form breaking off the rip on the side of the beach – often having to rescue up country visitors from the gnarly rip. A surf mission for us was a dawn hitch hike to Hawston, walking the last few kilometres after getting dropped along the freeway. A paddle out from the harbour across a very deep channel to the peak never seemed to be of a concern. Sharks seemed to be less of an issue back then. I guess ignorance was bliss. Nobody surfs here anymore. If the sharks don’t get you the gangsters on the shore surely will. There was, however, one wave. It was an immense beautiful wave that broke over the reef and peeled endlessly across the bay. It was hidden from view below some cliffs. It was a perfect wave but because of its size and power was not surfable. The cliffs, the deep water, the kelp, the sucking reef, the wave itself, ensured it would only ever be mind surfed. It was a fickle wave. In summer when the town got busy it rarely worked. In winter there was no-one there to see it break. We could see it breaking in the distance from the beach or whilst wandering along the cliff paths on our mission to sneak into the marine hotel pool bar to do some underage drinking. It was a wave for watching and mind surfing. Nothing more. 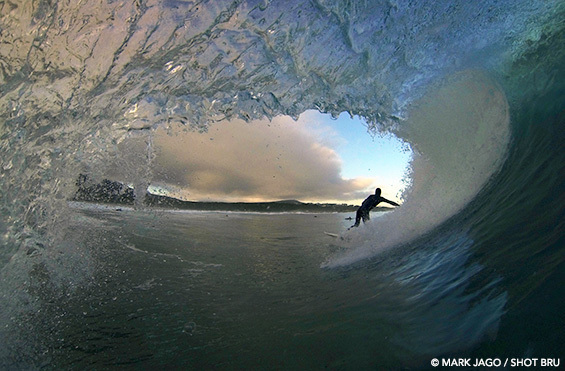 Although Voelklip was our local surf spot we hung out at Langbaai, the epi-centre of bodysurfing and teenage cool. We wore necklaces with a single fake shark tooth attached. Langbaai beach had the grommet area, teenage area, family area and the heavy cool area normally on a grass patch at the back of the beach – every beach has them. Anyways, it happened one summer holiday in the early eighties. Whilst hanging out we overheard the cool dude on the grass patch nonchalantly announce that he was going for a surf – at Bayview! Huh! We were stunned. We were impressed. We knew he was a cool dude. He had a kombi which he appeared to be living out of, smoked boom, had long blonde hair, wore beaded necklaces and leather bangles. He had one of those cool leather watch straps the guys in the army used to wear. He must obviously be a really good surfer as well. Apparently he had checked the reef out earlier in the day. This seemed unlikely to us as we had seen him stumble out of his kombi earlier that morning looking like he had slept in a shaping bay and inhaled too many resin fumes. The only thing he had checked out were the bikini clad chicks making their way down to the beach. 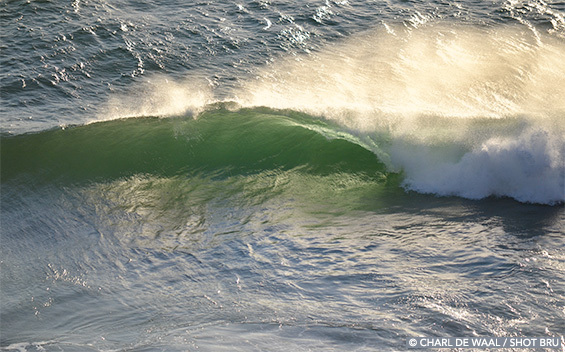 Despite it being mid-summer there was some serious swell running. However the conditions were far from ideal. It was already mid-afternoon and the shadows from the cliffs were already long. The south easter was starting to pick up and the swell had that nasty side shore thing going on with little white horses for good measure. However surfers were less fussy in those days. So what if it was a little side shore. 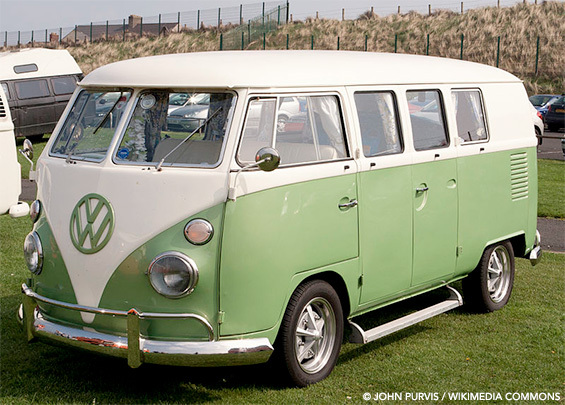 We hung out at his kombi while he suited up, waxed up his board and expertly rolled himself a perfect little spliff. Once done, the cool dude headed off along the coastal path with us following behind like the kids in the tale of the pied piper. I’m not sure why he didn’t drive as it was a proper walk along the path. Maybe he didn’t want to get bust by the boere. He was unsure of where to paddle out. He considered paddling out somewhere around Kwaaiwater. We could see this was a bad idea. He seemed to sense it too and continued on. This was when we suspected he had not surfed here before. This made the whole adventure more appealing. We smelled blood. The walk along the cliff top path now gave us a chance to view the wave properly – The swells running alongside the cliffs were not huge but the reef was breaking and that meant it was not small. The wind was stronger now. It looked very, very kak. He finally found a jump off spot somewhere close to the old harbour. The long walk had given the cool dude plenty of time to reflect. His initial bravado seemed to have waned significantly. But he had talked the talk and now he had to walk the walk. There could be no turning back. The jump off into deep water was non eventful and he began the long paddle down the coast. We followed his progress from the cliff tops as he paddled his trusty steed, a dated single fin with one of those classic 70’s airbrush spray jobs. We were already surfing twin fins. There was no fairy-tale ending. He wasn’t perfectly positioned for some magical set wave that appeared out of the deep. He didn’t free-fall down the face making a majestic Tom Curren-like bottom turn. He didn’t backdoor a barrel big enough to drive a bus through. He didn’t get spat out 100m down the point. He never actually caught a wave. It was clear he was exhausted from his paddle out. Besides he was never going to catch waves that size on that board. After initially sitting on the reef and paddling hopelessly for a few waves he paddled further and further down the reef eventually getting caught inside and paddled in (washed in) somewhere amongst the rocks in the distance. We met up with him on the path back after he had exited the water, amazingly un-scathed if not a little shaken. He was clearly more cool dude then surfer dude. Yet he had done it, much to his own relief for he seemed to realize he had bitten off a fair chunk more than he should have. He was chuffed. We were impressed. He had done this thing and done it alone. The next day when we went to the beach the kombi was gone. We did not know who the guy was. Just some oke in a kombi hanging out at the beach for a few days on his way up the coast. 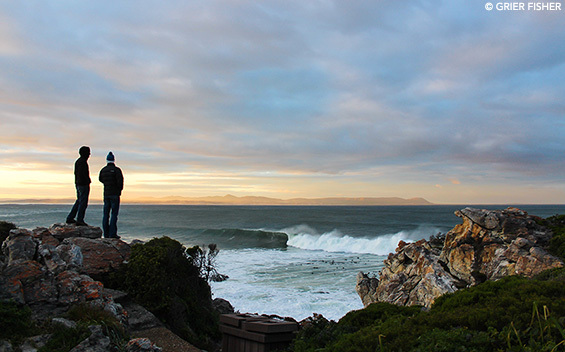 We only went to Hermanus occasionally thereafter. It was only a decade or two later I heard of guys starting to surf there. The cool dude may well have been the first guy to (try and) surf this spot. Send your stories to calvin@zigzag.co.za. One submission will be selected every six weeks to appear in Zigzag magazine. The selected submission will also receive a hamper from Billabong. At the end of the year, we will select and send one aspirant journalist from the competition on an all expenses paid assignment for a major feature in Zigzag. Zigzag retains the right to use any work submitted for the Zag Surf Journo competition on zigzag.co.za as outlined in the rules and terms of the competition. Zigzag reserves the right not to award a published winner in the magazine every six weeks, depending on the quality of entries. Zigzag is not obligated to run any and all entries submitted, either online or in print. Zigzag retains the right to edit all work submitted for brevity and / or clarity. Please note: Prize hampers will only be delivered within South Africa. A story worth telling, excellent – hope you write some more, enjoyed it. Lekker Story! Everybody has come across that cool dude at some point. A ‘cool’ nostalgic read! A story well worth sharing! I was just commenting this morning how “cool” is overrated when someone would rather remain appearing cool than losing themselves in a moment of fun, regardless of judgement. But then I read this article and remembered how awesome cool can be!